Abusive head trauma accounts for most deaths because of physical abuse and most serious head injuries among infants. Dias and colleagues evaluated a statewide shaken baby prevention program in Pennsylvania among parents of all newborn infants. There was no difference in the rates of hospitalization for abusive head trauma over the intervention period in Pennsylvania compared with those of 5 other states. The accompanying editorial by Leventhal et al discussed the need to move beyond mother-focused, antishaking education during the postpartum period to prevent the potentially devastating injuries of abusive head trauma. Pregnant women infected with influenza A(H1N1) are at a substantially higher risk for hospitalization and intensive care hovel admissions with a disproportionately severe clinical course. In this large cohort study conducted in Denmark, 61 359 children were followed up from birth to age 5 years. Children exposed to the maternal influenza A(H1N1) vaccination in the first trimester were not more likely to be hospitalized during the first 5 years of life than unexposed children. Children of mothers vaccinated in the second or third trimester had a 7% lower risk of hospitalization, primarily a result of a reduced risk for infection-related hospitalizations. These results support the safety profile of the influenza A(H1N1) vaccine used during pregnancy. Globally, 43% of children younger than 5 years have anemia, 42% of which is attributable to iron deficiency. In this randomized clinical trial, half of the 540 infants were randomized to undergo delayed cord clamping after 3 minutes and the rest to undergo early clamping within 1 minute. The risk of anemia was 11% lower at 8 months and 9% lower at 12 months among infants with delayed cord clamping. If this simple, no-cost intervention was implemented globally, this could translate into 5 million fewer infants with anemia at 8 months of age. While outcomes for very low-birth-weight infants have improved over 25 years, there are still substantial variations in care in neonatal intensive care units across the United States. Horbar and colleagues used 756 hospitals in the Vermont Oxford Network to examine the time it took for neonatal intensive care units to achieve the best quartile from 2005 for death and serious morbidities. 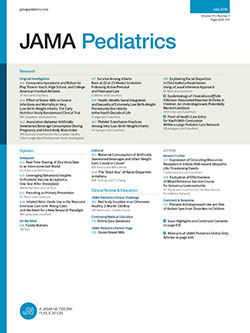 It took 3 years before 445 neonatal intensive care units (75%) achieved the 2005 adjusted rate from the best quartile for death prior to discharge, 5 years to achieve the rate from the best quartile for late-onset infection, 6 years to achieve the rate from the best quartile for severe retinopathy of prematurity and severe intraventricular hemorrhage, and 8 years to achieve the rate from the best quartile for necrotizing enterocolitis. In his editorial, Lorch discusses the persistent variation between hospitals, the volatility of rare outcomes, and the need to explore population-based outcomes of perinatal care.